Climate change and population growth are increasing pressures on water resources in the UK. A recent Water UK report identified that we are facing longer, more frequent droughts – and will face more acute droughts in future than previously thought, right across the UK. Significant innovation and increased water efficiency have an essential role to play in helping ensure we have enough water for people, the economy and the environment now and in the future. We need to tackle water and fuel poverty – and water efficiency cuts bills and energy use. It’s also central to moving to a more customer-led water sector which can keep up with other sectors. There is already a great deal of excellent water efficiency work involving a range of actors being undertaken across the UK – through setting out focussed recommendations and actions, this strategy is providing a framework via which we can drive even more ambitious water efficiency action and ensure future work is focussed on key areas. 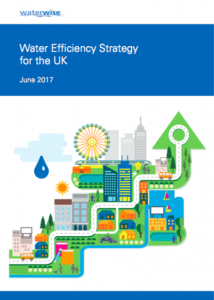 The strategy was developed in consultation with the water sector – including Waterwise supporters and the Water UK-supported steering group. It sets out a blueprint to deliver a vision of a UK in which all people, homes and businesses are water-efficient, and where water is used wisely, every day, everywhere.